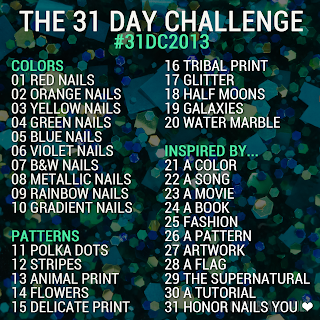 I've survived to day 3 of the 31 Day Challenge! I think that deserves a pat on the back. 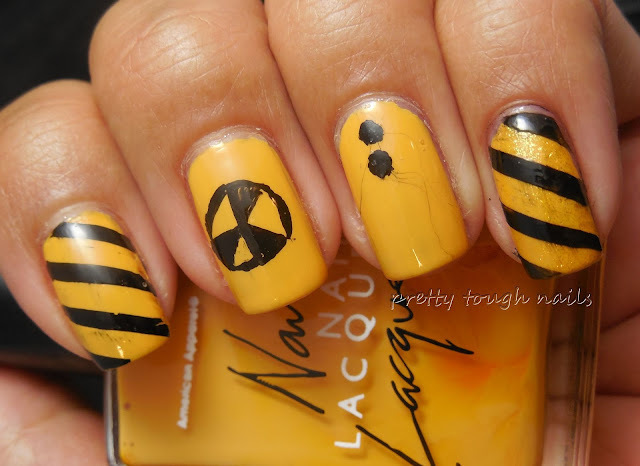 Although, you may want to reneg it after you see this mani! 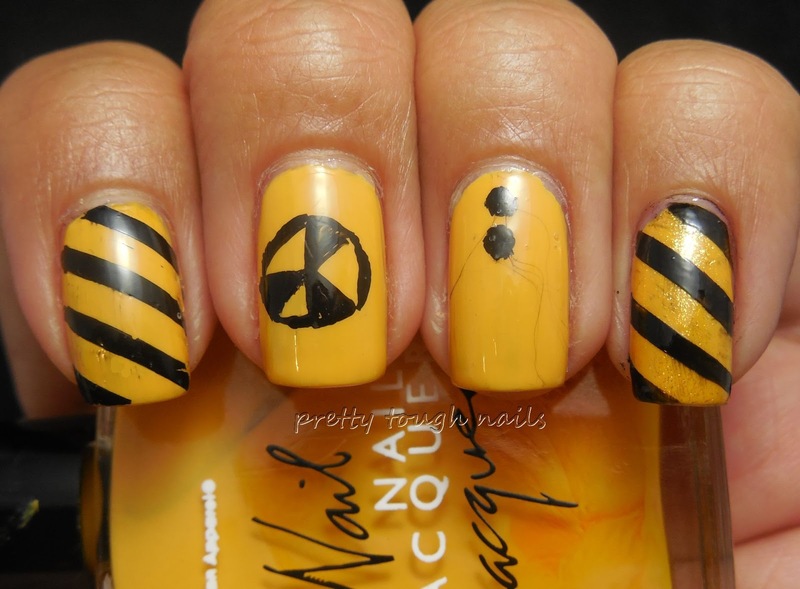 Today's challenge is Yellow Nails, and I was hard-pressed to come up with something clever. I couldn't really think of anything too witty, but instead I came up with something that made me reminisce about my younger years when I would go out dancing with the friends. We use to go to a party called Shelter at club Vynyl in Manhatten, and we'd go rain or snow and stay up all night long into the wee morning hours dancing the night away, listening to soulful deep house. I sometimes miss those nights and freedom we had, but these days I'm too old to go out to the clubs anymore. 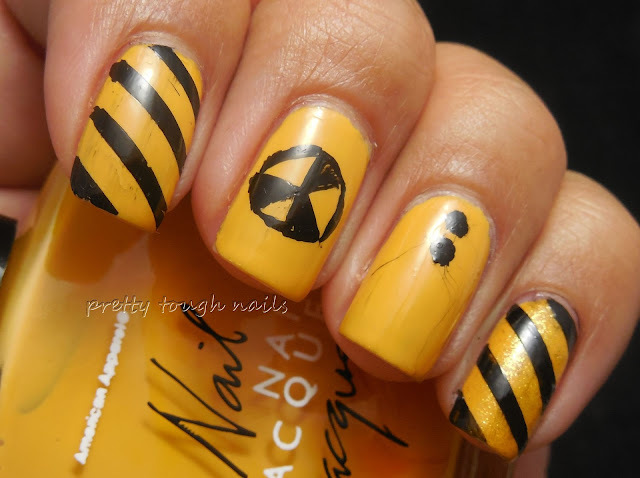 This mani is a mash up of Shelter's logo, which was the sign of a fallout shelter, and some warning tape. I started with a basecoat of American Apparel Manila, a deep buttery yellow cream. As with any yellow, it was streaky the first coat but finally built up to even opacity on the third coat. I finished with a quick coat of NYC GCS and started the design. On my pointer and pinky I used tape to create the warning tape stripes, and then on my middle finger I did the Shelter logo using WnW black creme. I did a couple dots on my ring finger to keep some visual interest. Oh! I also used a layer of China Glaze Lighthouse on my pinky and thumb to add some sparkle. I finished with a layer of Poshe, which of course smeared some of the black polish. Well, seems like I still a bit of practice when it comes to not smearing my artwork. I let it dry for at least ten to fifteen minutes, but it doesn't seem to be enough time. Not sure how I work the extra time for drying when it comes to being at the beck and call of a baby, but I guess it'll figure itself out if I manage to finish this challenge! 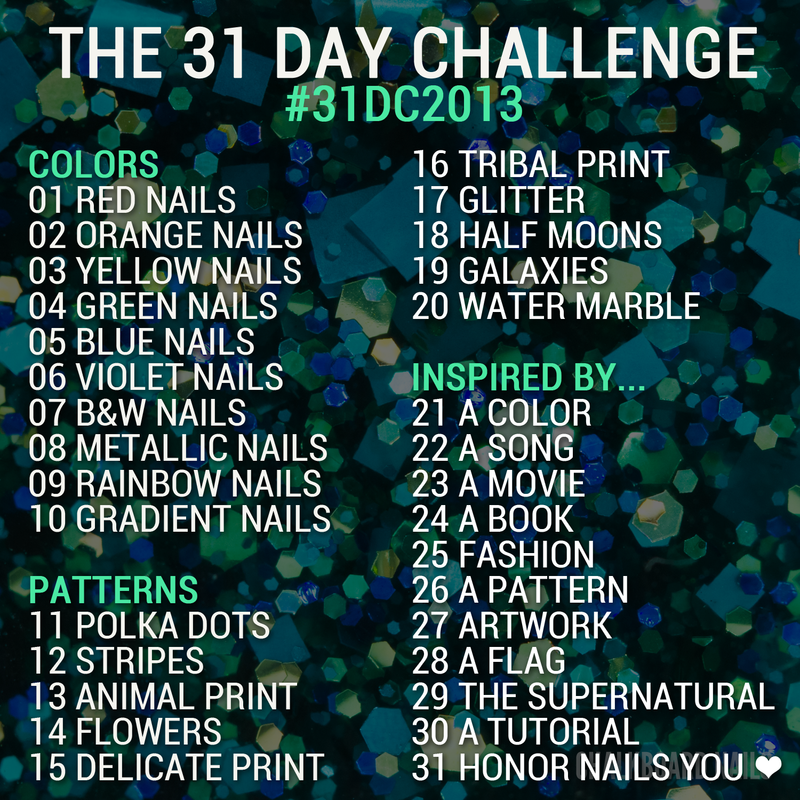 Be sure to check out the rest of the yellow manis for the 31 Day Challenge! 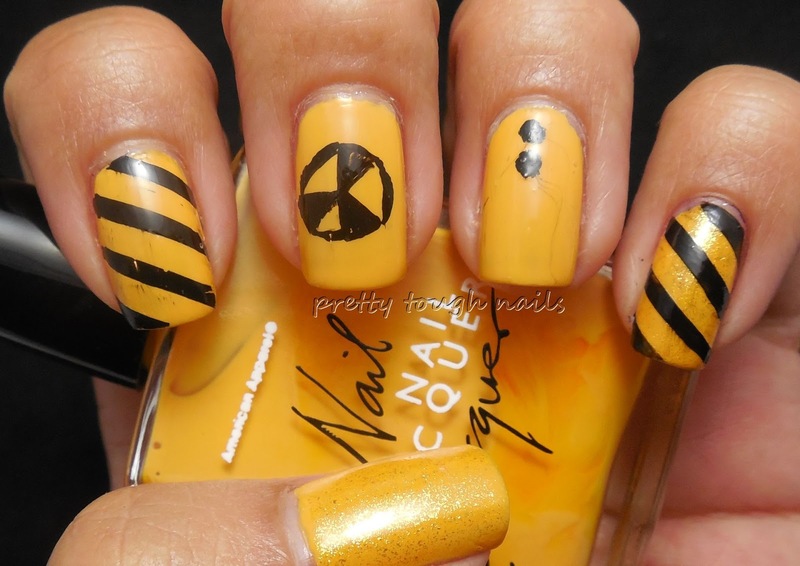 I love this idea for yellow. Warning tape. I'm going to remember this idea if next time I try the 31DC.